Our low pressure alkaline solution kills the Moss and algae at its root immediately, giving you a truly thorough and effective cleaning. When we provide your roof cleaning not only do we guarantee that all the Moss and algae will be gone, we give you a three year 100% guarantee. If any black streaks or green algae happen to return on your roof within the three-year period we will come and clean that area free of charge. If you would like your roof cleaned just give us a call and we can set you up with a no cost estimate. Or click HERE and fill out a quick form for an instant quote! Call us for a roof cleaning service in Easton Maryland! Get the dirt, algae, and mildew cleaned off of your roof and siding, call us today! Easton Maryland Roof CleaningThis home has black staining only on the North side of the roof. We gave a customized price just for this side, since the other half didn't need it. We used a pressureless detergent that kills the algae that causes the stains. It looked good instantly. This 4500 square foot home in beautiful Chestertown had been built about 15 years ago. The Beautiful siding and roof were dirty and needed to be cleaned. The stucco siding was clean using a low pressure pump, rated only 100 PSI. Thus no paint or trim was damaged in the cleaning process, so no repainting was needed. That alone saved the homeowners a large headache. The roof was cleaned using our shingle manufacturer recommended detergent. It too was applied with a soft wash pump, and it kill the algae on contact. This entire wash service made the home look almost like new.The gutters were also cleaned out. Scott I was very happy and impressed with your work. I will call again. I have a lot of windows in my old Victorian house on the Chesapeake Bay. 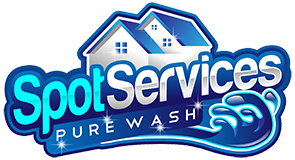 I have relied on Scott for his quality, efficiency and well-priced services. I have recommended him to many people. Scott has done work for me for the last several years. He is honest, hard working, returns phone calls in a timely manner, calls if he's running late or needs to adjust appointments, and has a pleasant, professional manner, and he's fast, and doesn't delay. His prices are fair, and if he misses something, he corrects it. He's ambitious, and wants to do well. And he will. He obviously has my support. Scott did an excellent job from start to finish. Was on time for the original estimate, sent email reminders and had no problem when I needed to reschedule. He washed my house then cleaned the windows. I was thrilled with the fantastic job he did. I would definitely recommend him to anyone needing this service. I like the way he does business. Scott - I can't get over how good our brick walkways look since you power washed them. 12 years of mold and mildew gone! They look better than when they were put in! We appreciated the special care you took to keep the chemicals out of the gardens also. Thanks so much. We’d love to hear your feedback. Click here to submit your testimonial.